‘Princess Lira is siren royalty and the most lethal of them all. With the hearts of seventeen princes in her collection, she is revered across the sea. Until a twist of fate forces her to kill one of her own. To punish her daughter, the Sea Queen transforms Lira into the one thing they loathe most—a human. Robbed of her song, Lira has until the winter solstice to deliver Prince Elian’s heart to the Sea Queen or remain a human forever. Okay so first thing’s first… I am absolutely gutted that this is a standalone book! What had me set on requesting it from NetGalley was the very first line of the summary: ‘Dark and romantic YA fantasy for fans of Sarah J Maas – about the siren with a taste for royal blood and the prince who has sworn to destroy her.’ So basically I completely had to read this book! The main reason why I’m giving it 5 stars is that it definitely lived up to that, the main character of Lira was so sassy that she really did remind me of some of Sarah’s sassiest characters. In terms of the world building, Alexandra has created such a remarkably unique world and you become immersed in it so easily. The descriptions help also, being very detailed down to every part of the mermaids and sirens even. The differences between the different regions of the world are also so unique and mystical to read about. Right down to the rooms the the characters go into even they’re described amazingly well, such as the library in Prince Elian’s home with a white marble floor and crystal ceiling (I so badly want a library like that). So, the prince. Imagine a young Jack Sparrow who has to spend more time on land because he’s also a prince. And then you have the amazing Elian! He even has a magical compass – but his has two points and can tell if someone is lying or speaking the truth. In addition to this, he has the humour of a typical pirate which makes him a perfect match in word fights with Lira. In terms of the other characters, of course I’ve already mentioned the two main characters Lira and Elian, but there were a few more which really stood out. Obviously the Sea Queen stands out, she’s this heartless and vicious thing who you can’t help but despise from the very beginning. In terms of Elian’s crew, my absolute favourite was a couple called Madrid and Kye. Madrid is the only female member of the crew with sass which almost matches Lira’s and the constant jokes between her and Kye (her boyfriend) are ridiculously cute to read! Structure wise, the chapters follow either Lira or Elian’s point of view. This works so well and there is little overlap between the time, with the point of view being from the character most central to each chapter. If the amazing characters and world building isn’t enough for you to pick this book up, then the plot most definitely will be! Without giving too much away, Lira does something that the Sea Queen (her mother) doesn’t like and so she punishes her by making her human (as she sees that as the worst punishment she could give her). As a human, she is saved by Elian and his crew and ends up adventuring with them to find an important object. 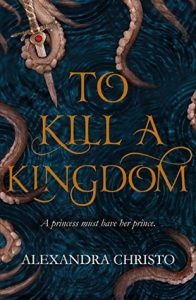 The whole story is very reminiscent of a Little Mermaid retelling, but one which is darker and most definitely will be attractive to fans of Sarah J. Maas stories. There is deceit, romance, sassiness, and amazing fantasy throughout, and the ending is one of the most tear jerking ones I have ever read – I honestly didn’t want it to end! It was adorable though and perfect and really did wrap up things very well (although I would not object to a sequel or prequel still). Tying together everything in such a dramatic way also. This one caught my eye after it was a little late to request an ARC, and you’ve made it sound even better than I was hoping! Can’t wait to pick this one up later on this spring 🙂 Great review Luchia! This sounds so interesting! Unfortunately I wasn’t able to get the ARC but will definitely pick it up when it’s released! Great review!